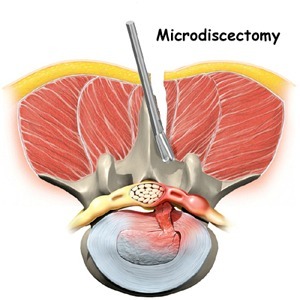 Discectomy and Micro-Discectomy are basically used to describe the same procedure. A while back a discectomy was a more invasive way to operate on the spine and remove parts of a herniated disc. Microdiscetomy produces less damage to surrounding tissue than more invasive back surgeries (such as a spinal fusion). Microdiscectomy is minimally invasive spinal surgery that requires a small incision and uses a microscope to view the disc and nerves. This allows the surgeon to use precise tools to weave into the spinal tissues and remove a portion of the damages inter-vertebral disk. Today there are two main types of microdiscectomy. One requires the removal of a piece of the vertebrae (referred to as Laminotomy or laminectomy) and the other surgery does not. With Laminotomy bone material is removed from the area creating more room for the surgeon to work (this is also used to remove any non-disc material that might be causing issues with the nerves).Laminectomy is often used to treat spinal stenosis. The basic micro-discectomy does not require the bone to be removed but just the part of the spinal disc that is herniated and is impinging on the nerves. With a typical micro-discetomy the back muscles are actually pushed aside (instead of cut through) and recovery time is very short (a couple days). Removing the irritation or impinging on the spinal nerve is said to speed the natural healing process of the body. Some relief from microdiscectomy may be felt immediately however it can take months for the nerve root to fully heal and associated numbness and weakness to improve.There is evidence that Discectomy may provide quicker pain relief when compared to nonsurgical treatment however the long term results are not as clear. According to two long term studies (Maine Lumbar Spine Study) there was no significant differences in the long term activity level (after 5 and 10 years) of patient that had surgery versus those that did not. Another less common, but less invasive procedure, percutaneous discectomy is also used to treat lower back pain. This treatment uses various technologies to remove tissue from the middle of the spinal disc using IV sedation (versus general anesthesia). The process is performed by inserting a needle into the center of the spinal disc and removing tissue (and pressure) from the nucleus. The theory is that the disc decompresses (and the bulge retracts) when central tissues is removed. As pressure is relieved from the nerve pain is subsided. This procedure has a quicker recovery time and less scar tissue formation than with a typical disectomy. Another less common spinal disc removal method is Hydro-Discetomy. This minimally invasive procedure uses high pressure water to remove parts of the spinal disc. An incision is made a few centimeters off the mid-line on the side of the spine. The access guide needle is positioned under live fluoroscopy. The needle is advanced into the center of the nucleus. Proper placement is confirmed with fluoroscopic images. The water jet is then inserted through the working cannula (tube) and activated using a wanding/rotation motion within the nucleus pulposus to break up and removes disc material. Following that step an epidural steroid is injected. Non Traumatic Discectomy procedure uses a probe to perform this minimally invasive surgery. A small “nano” probe is inserted between the vertebrae and into the damaged spinal disc using an x-ray and a magnified video to guide. Nano tools work through the hollow center of the probe to remove the offending pieces of disc. Some physicians claim that along with removing disc fragments the nano tools can push the bulging disc back into place. The downside is that the results of these procedures may not be as effective as more the invasive ones. ©2013 Lower-right-backpain.com. All Rights Reserved.